Death. In real life it’s about as unavoidable as explosions in a Michael Bay movie or my insistence that Assassin’s Creed is actually pronounced as Assassin Is Creed. In comic books however, death is a vacation. A blissful two-year (or longer if you’re Uncle Ben) hiatus before your character bounces back into action with an all-new number one issue. And that’s the central theme of the first issue of Marvel’s Civil War II. The sequel that nobody was expecting kicked off last week, opening up with a big death halfway through. So uh, spoilers from here on out if you haven’t caught up yet. This time, it was James “War Machine” Rhodes who got future endeavoured in a death that actually occurred earlier in the pages of Civil War II Preview during Free Comic Book Day. Ouch, that’s going to leave a mark. In the first issue of Civil War II however, that death has been grimly confirmed. The War Machine is dead. That’s one hell of a death to start Civil War II off with. Rhodes has been getting a lot of face-time lately, which now reeks of foreshadowing. Everything from the possibility of War Machine one day being president of the US of A to his romance with Captain Marvel, ideas designed to make a likable character have a bigger punch to the gut when most of his torso was blasted off of him by Thanos. According to Marvel’s editor-in-chief Axel Alonso, killing one of the most prominent black super heroes in Marvel history during a new push for more diversity within the ranks of those comics, wasn’t an easy decision. “This was a hard decision. Brian was walking us through his story notes at a retreat, and he needed something to happen at the end of issue #1 that would ratchet up the stakes,” Alonso said to CBR. That’s where the scene we see the aftershocks of the assault on Thanos comes in. We started to workshop a scene that had a group of heroes, strong in their convictions, go out on a mission to stop one of Ulysses’ predictions, and we realized that for the scene to have weight, not all of them should come home. It was gut-check time. After we’d assembled the team, it was Brian who said it made most sense for War Machine to be the casualty of that operation, and the discussion began. We examined it from all angles, the more and more we talked about it, the more we saw that the death of Rhodey — given his profile in our universe, the fact that he was strongly aligned with Carol’s position in regards to Ulysses, and his relationship with both Carol and Tony — would have the most impact, and cast the broadest shadow over everything that happened after. Brian also felt that Rhodey’s death would create an additional dynamic in the story because it would unhinge both Tony and Carol, and bring an emotional component to fuel their passion and, at times, overwhelm their reason. Let me be very clear: We carefully considered the fact if we were going to kill Rhodey, a beloved African-American character, at a time when we are taking great pains to diversify our universe — with characters like Black Panther, Miles Morales, Sam Wilson, Kamala Khan, Amadeus Cho, Robbie Reyes, Moon Girl and more playing prominent roles — we needed to have a long-term plan that proved we intend to stay on that course, and we needed to be able to unveil parts of that plan quickly. Which we will. Civil War II continues in the pages of many, many other comics in the months to come. 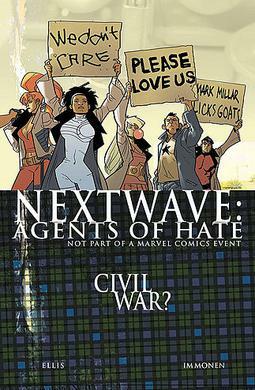 Except this time, there’s no Nextwave: Agents of HATE to make fun of it. Awww.